Patrons in the equine industry have been hearing of a new treatment on the market recently: Pro-Stride. Could it benefit my horse? Along with its anti-inflammatory properties, it has been shown to have a greater concentration of growth factors compared to other modalities. Growth factors are other proteins within the body to help signal cells that stimulate growth and healing. Examples of these would be cartilage-specific or collagen-specific growth factors that when injected into a joint or tendon, stimulates repair of that area. 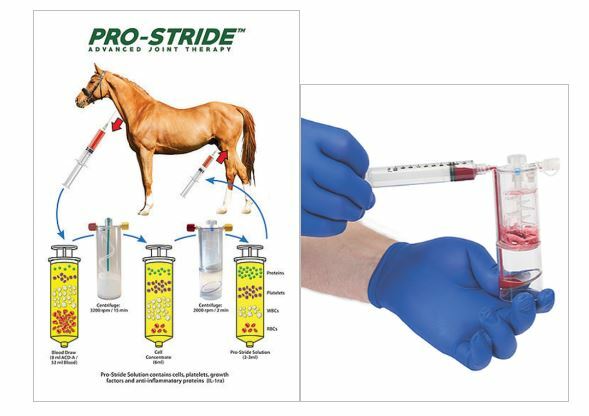 Studies have shown that Pro-Stride relieves pain associated with osteoarthritis (in dogs and horses) and slows degradation of cartilage, but its full effect on cartilage health have yet to be published. The advertised pain relief is up to one year, and unlike the IRAP systems, a single injection is the only treatment required and processing is less than 20 minutes. 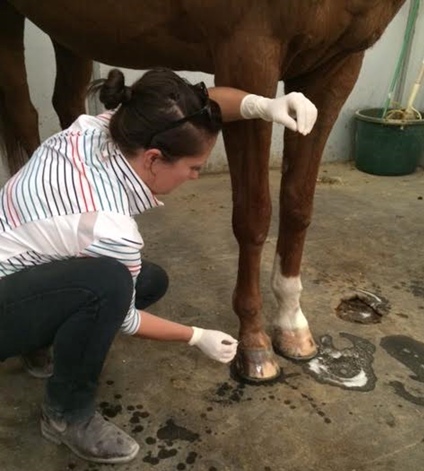 Stall side treatments such as this are convenient and efficient, especially when an injury needs to be addressed immediately. Most research has studied its efficacy on joints, but its use in tendon and ligament injuries are promising. Nothing can substitute good old-fashioned rest and rehabilitation, but regenerative treatments have been shown to improve the quality of healing, and lessen the chance of re-injury in our equine companions. Pro-Stride is marketed and sold under the company Owl Manor Veterinary, to read more about this product their website can be viewed at http://www.omveterinary.com/pro-stride. Please contact Bayhill Equine, Inc. for pricing and any questions regarding this service. Bertone, Alicia L., Akikazu Ishihara, Lisa Zekas J., Maxey Wellman L., Katharine Lewis B., Rebecca Schwarze A., Andrea Barnaba R., Michael Schmall L., Peter Kanter M., and Ron Genovese L. "Evaluation of a Single Intra-articular Injection of Autologous Protein Solution for Treatment of Osteoarthritis in Horses." American Journal of Veterinary Research 75.2 (2014): 141-51. "Owl Manor Veterinary | Regenerative Medicine | Pro-Stride | PRP | BMA." Owl Manor Veterinary | Regenerative Medicine | Pro-Stride | PRP | BMA. N.p., 2016. Web. 12 Sept. 2016.